History Books covering Bodalla, Narooma, Montague Island and Tilba Tilba and Central Tilba on the Far South Coast of NSW. The Author: Laurelle Pacey is an agricultural scientist, journalist and historian who lives on NSW’s far south coast. 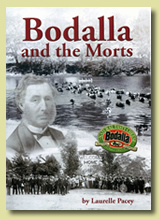 Bodalla and the Morts is the fascinating history of how Sydney entrepreneur Thomas Mort set up the Bodalla Estate in the 1860s and how he made it a showplace of the Colony’s industrial enterprise by producing cheese to rival English imports. It tells of the Estate’s changing fortunes, its people over 130 years, the Mort family’s long association, and the Estate’s sale and breakup in 1989. 144 pages, over 160 images. Cost $40, plus $10 p&p. 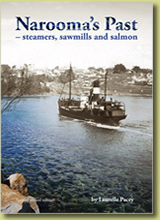 Narooma’s Past – steamers, sawmills and salmon evokes Narooma’s rich maritime history - the coastal steamers that carried locally timber to Sydney, goldmining, the many sawmills around Wagonga Inlet, the stylish 1930s when Narooma was ‘the’ summer tourist destination for the well-to-do, Australia’s first commercial fish cannery and the many people whose lives have played out ‘on the river’. 140 pages, 189 images with maps and table of ships that called at Narooma. Cost $38, plus $10 p&p. 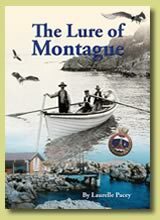 The Lure of Montague - tells of Montague Island’s significance to Aboriginal people, the history of its lightstation, stories of people drawn there over the years for work, sport, or to appreciate its wildlife. This third edition is greatly expanded with many more stories and pictures, including many photos from Montague families’ albums, and includes a table of known Montague lightkeepers 1881-1987. 90 pages, 103 images (including maps). Cost $30, plus $3 p&p. 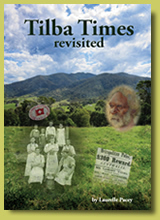 Tilba Times revisited - The Tilba district is dominated by Gulaga, a special place for Yuin people. This history begins with the Dreaming and includes early contact, goldmining and the dairying industry, the Bermagui Mystery, Wallaga Station, heritage listing of Central Tilba and Tilba Tilba, the Hand Back of Gulaga and Biamanga and current initiatives. 124 pages, 144 images (including maps). Cost $35, plus $10 p&p.